Explore the La Concepción Church in San Cristóbal de La Laguna, Tenerife. The Iglesia de la Concepción Church is located between the squares of Doctor Olivera and La Concepción, in San Cristóbal de La Laguna in the island of Tenerife. The Nuestra Señora de La Concepción has been considered Cultural Interest Good in the category of Historical-Artistic Monument since 1947. One of the main reasons for this nomination was the fact that this was the first parish on the island of Tenerife, built after its conquest in 1511. This church maintains on its interior different valuable pieces as the wooden work pulpit made by the french artist Veray, a ceramic Sevillian baptismal font from the XV century where the first christian locals were baptized, a wooden pyx used on this island’s first Corpus and many precious golden pieces and sculptures from the Canary Islands and Europe. 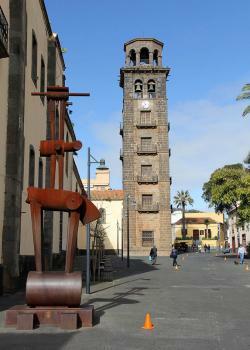 Plaza de la Concepción, San Cristóbal de La Laguna, Tenerife.